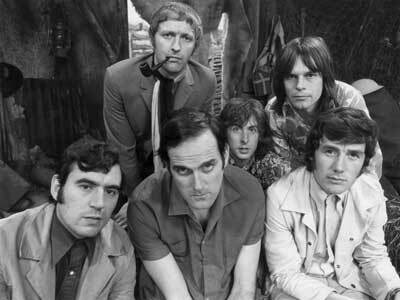 Monty Python’s Flying Circus made its television debut on October 5, 1969, at 11 pm, after most Britons had gone to bed. The episode was entitled “Whither Canada?”, yet there wasn’t a single mention of Canada during the entire program. It should have been immediately apparent if you were looking for logic or reason that Monty Python wasn’t the show for you. However, if you had a rather warped sense of humor and wanted to laugh your buttocks off, you were in for a treat. The team did know they wanted to do something – yes – completely different. They intended to push the boundaries of traditional sketch comedy and eschew predictable set-ups and punchlines. Instead, they would employ a stream-of-consciousness approach more in tune with the late ‘60s vibe and their own irreverent senses of humor. But they needed a name for their show. The guys were toying with Owl Stretching Time and The Toad Elevating Moment. The BBC had suggested the Circus. “Monty Python” was a name the group envisioned as the perfect moniker for a sleazy entertainment agent, and so Monty Python’s Flying Circus was born. Several factors made it possible for Monty Python to convey its revolutionary ideas and almost manic pace. For one thing, it was shown in color, a huge boon with their type of over-the-top shenanigans. Another was the ample use of Terry Gilliam’s vibrant animations as a linking device between completely unrelated scenes, allowing their hoped-for stream-of-consciousness approach to pan out successfully. And, of course, there was the undeniable talent and perfectionism of all the Pythons at play. They took on the roles of virtually every character during the entire series, with the exception of those played by Carol Cleveland. It took a little while for the program to find its audience, but once it did, it quickly amassed a large group of dedicated followers. One of their biggest fans, George Harrison, often claimed that the zany spirit of the Beatles had been passed down to Monty Python. The group continued to do live performances until Graham Chapman’s death on October 4, 1989. In 2005, “Spamalot” a re-working of “the Holy Grail” written by Eric Idle and John Du Prez hit Broadway and won a Tony Award for Best Musical. In 2014, the surviving members of Monty Python reunited for a series of live shows. They had originally planned to do one performance, but the demand was so great the lads ended up doing a ten date residency at the O2 in London. The final performance was watched by around 50 million people around the world. It’s been almost a half century since we first met them, and their influence on comedy and pop culture still resonates to this day. After all, when you hear the word “SPAM”, whether you think of junk mail or disgusting meat in a can and singing Vikings, you’re still feeling the influence of Monty Python who inspired the name for those messages with that skit. In the end, Monty Python is living proof you can be silly without being stupid.